Use these childrens birthday party ideas to create the coolest birthday ever. Kids birthday parties are special celebrations, but they don’t need to break the bank! 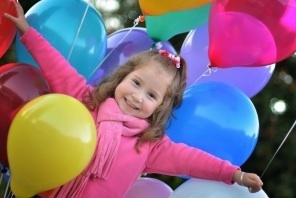 Choose more eco-friendly options for your birthday parties. Free birthday cards online – Save money by using free printable birthday cards and invitations online or go green with free e mail birthday cards and party invitations. If you choose the free printable birthday cards online, you can buy white card stock and a box of envelopes at a local office supply store. I use the 4.25 x 5.5 inch size that works well for most invitations. (2-4 invitations per page). You can design them at home, and put on a thumb drive to print at a local office supply store such as FedEx Kinkos or Office Depot. You can also find many cute and funny printable birthday cards and invitations online. Photo birthday cards are another fun option. You can upload your own photo and print birthday invitations and birthday cards online. Costco photo center has some cheap options. Reusable decorations – Keep the “reduce, reuse and recycle” concepts in mind for childrens birthday party ideas for decorations too. For example, use mason jars as glasses, with colorful straws. Reuse the jars in your kitchen. Buy some cute fabric or a beach towel to use as a table cloth, then you can wash and reuse it for something else. I’ve purchased solid red placemats and serving trays that I’ve reused for birthday parties, Valentine’s day, 4th of July and Christmas parties. You can also buy a few nice mylar balloons and later deflate them and reuse them for another party. If you have a birthday banner, reuse it for next year. Location theme - Take advantage of the location to minimize the need for party decorations, and to provide a theme. If you have a party at a local park with a nice canopy of trees and green grass, do you really need decorations? Same idea for a birthday at a theme park or local attraction. 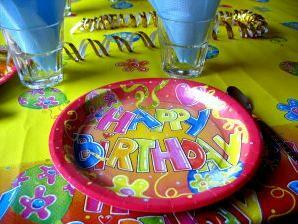 For specific children birthday party ideas, see our page on childrens birthday party themes. Decorations that double as party favors - Another great tip for moms and kids birthday parties is to let your decorations double as party favors. Decorations that double as craft, games and food - Kids love to do things, so make your decorations be the materials the kids will use during the party for crafts, games and food. Keep reading for more childrens birthday party ideas. One of the best childrens birthday party ideas is to not use junk birthday party favors, as the junk quickly gets thrown in the trash. The best birthday party favor ideas are to be creative, such as cute but healthy snacks that they will eat, and something that the kids helped make. Ribbons – Reusable ribbons make great alternatives to balloons to add some flair to the birthday party. Girls can make their own fairy streamers to take home as a party favor. Plants – if the season is right, have an outdoor garden party and explore the fun of plants. You can use small plants as table decorations that also become party favors. Choose fun flowers or edible plants that the kids will enjoy such as cherry tomato plants or strawberries. Reusable sandwich or snack bags – Make your own or buy reusable sandwich or snack bags to be used as party favor bags. Fill with healthy snacks for the kids to eat on their way home from the party. Knot tying – teach kids some outdoor skills such as knot tying and for a party favor they can take home a colorful cord with an emergency whistle, tied with some knots. Treasure map – hunt for hidden or buried treasure with a treasure map. Leave up to 10 hidden clues along the way as they search for the hidden treasure. This works well in a large safe area like a park or green belt, safe from cars so they don’t run in front of a car. Treasure can include jewels (beads), gold coins (chocolate) and silver dollars. The kids can divide up the treasure as their party favors. Girls can make necklaces from the beads.